The “King of the Fortnight” on Colher de Tacho is ginger. I had a hard time choosing a recipe to make – everything I saw seemed delicious! The only thing I knew was that I wanted something sweet. Many of those recipes called for glacé ginger or crystallized ginger and I couldn’t find any where I live. I wasn’t sure I was going to have the time to search for it in São Paulo. So ground ginger became my choice. I was impressed by how easily and quickly I made these cookies – the dough was prepared in no time using my good old mixer. And while it was in the fridge, I made dinner. Perfect timing. Recipe from here – I saw a link to this site in someone’s blog (sorry, I can’t remember which one!) and got completely addicted to it. Preheat oven to 180°C/355ºF. Line 2 baking trays with baking paper. Using an electric hand mixer, cream butter, sugar, golden syrup, ginger, nutmeg, and salt until pale. Add egg and beat well. Sift remaining ingredients over butter mixture. Stir until a soft dough forms. Wrap dough in greaseproof paper. Refrigerate for 20 minutes. Roll teaspoonfuls of mixture into balls. Place onto baking trays, allowing plenty of room for spreading. Bake for 12 minutes or until golden. Allow to cool on trays for 5 minutes. Transfer to a wire rack to cool completely. Oh Patricia - these cookies are a perfect description for me as well - Ginger Nut! LOL! 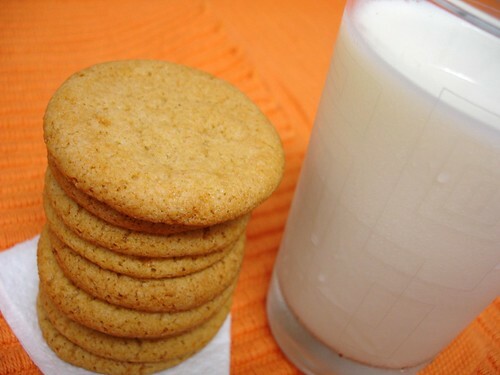 They look (and sound) fabulous - particularly with a cool glass of milk to wash them down! Patricia, is golden syrup like Karo syrup here in the US? Or is it thicker, like molasses? These look delicious, Patricia. Are they chewy or hard and crunchy? I actually love the storebought ginger snaps sold in the U.S. by Nabisco--they're so hard you must dip them in milk to eat them. 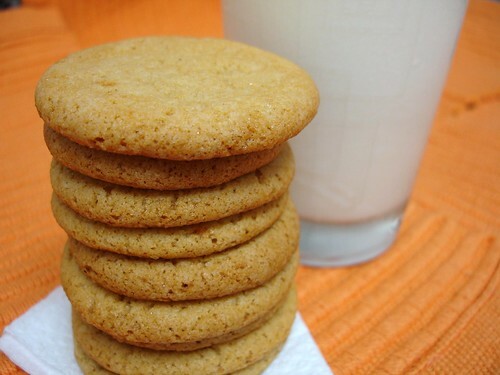 Most ginger snap recipes I've seen tend to produce softer, "more normal" cookies. But soft or crunchy, I want these right now! Golden Syrup? Count me IN! Wow, these look great. Good call on the nutmeg. I can't imagine what 2 teaspoons would do. Mmmm ginger cookies, though being a nutmeg lover I would have used the whole amount. These sound wonderful. I love how perfectly uniform yours are. You're as good as a professional baker! These are the kind of cookies that I don't know how to STOP when eating them. hehee I love ginger and this cookie looks both crunchy and chewy.. is it? Thanks for the recipe, these could become a staple for us at Christmas time! Hi, ta2urnfs, tks for stopping by! Anne, I doubt that - I've seen so many wonderful things on your blog! Gilly, they were perfect with milk. I don't drink coffee, but I brought some to my coworker and she said they were great with black coffee! Lydia, you are right, sweetie! Karo, that's it. I actually chose this recipe because I didn't have molasses at home. Terry, they're crunchy on the edges and chewy in the center. Please, my dear friend, have some! Tina, every time I see ginger it reminds me of you - even before this event. Anh, you are so talented, sweetie! Claudia, thank you for the visit! Brian, I wanted ginger to take center stage, that's why I cut back on nutmeg. Peabody, let me know if you try it with the whole amount, I'd love to hear your opinion. You're right, crunchy on the edges and chewy in the center. I thank you for your lovely comment, sweetie! Quick and easy...my kind of recipe! Delicious!